School was cancelled these past two days, which means I haven’t been in class since Wednesday evening. I’m hoping that tomorrow will be cancelled as well, which would mean I would be out of class for TWELVE days (I don’t have classes on Thursdays and Fridays, and this Monday is Presidents Day). This is basically longer than my Spring Break, which is coming up at the end of February. 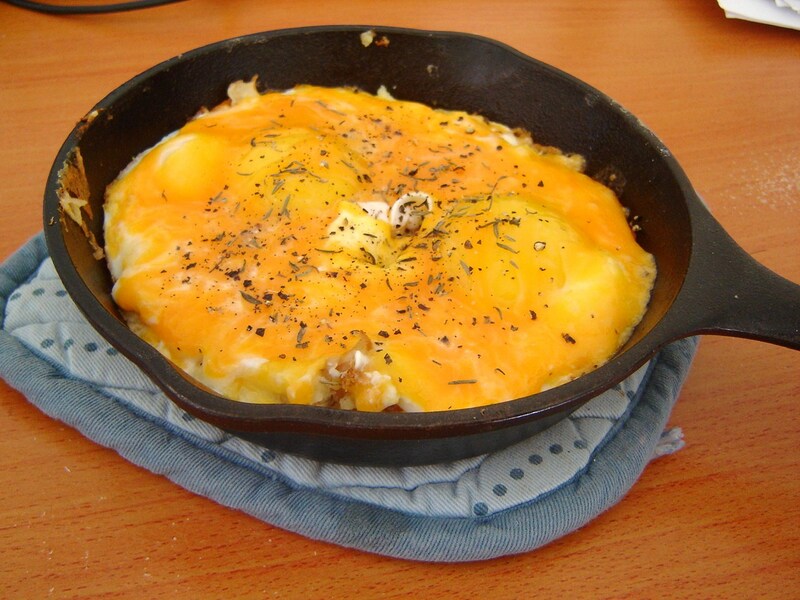 I had purchased two small 5″ Lodge cast-iron skillets for this very purpose but seldom use them. I should more often. Although this was a good introduction to the day, I had bigger ambitions for the evening. See, my roommate Alex was coming home from Europe yesterday, and I figured I should welcome him back to the US of A with a proper meal of lamb shanks and butternut squash. But how do I cook lamb shanks? I’ve had them before, most memorably at my old Berkeley Restaurant, Adagia. Prior dining experience, however, does not cooking expertise make. Thus, I looked at a few recipes, here, here, and here, blending them all together and hoping for the best. The technique? Braising at low temperature for a long, long time. 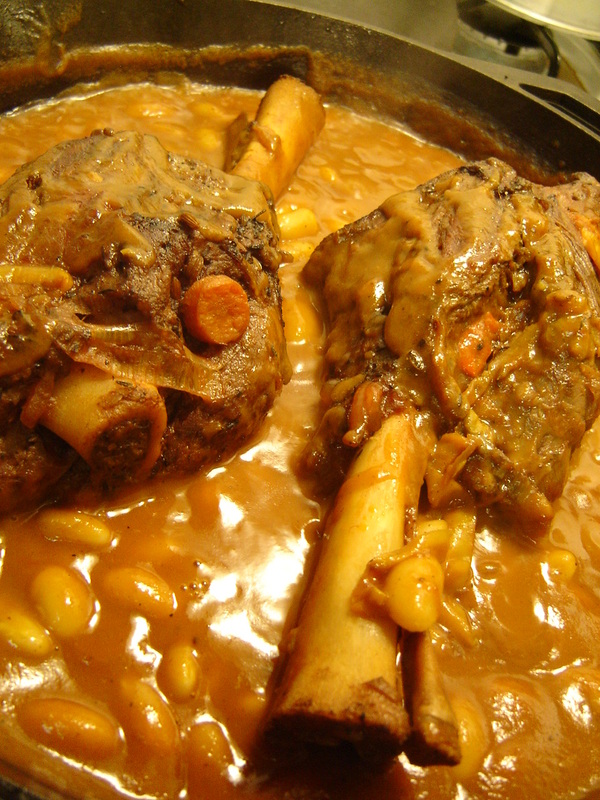 I had purchased two lamb shanks at Eastern Market a few weeks ago, and though I’m loathe to do so I had to freeze them. No matter. After defrosting for two days, the lamb shanks were ready. I wasn’t sure about how tender they were going to be because of the freezing, so I played it safe by marinating them in olive oil, pepper, thyme, fennel seeds, and curry powder and cardamom. In retrospect, I think I’d remove the last three ingredients because they imparted a sort of Eastern/North African flavor I didn’t exactly want. The shanks marinated in this mixture for four hours in the fridge. I would need veggies for the stock. 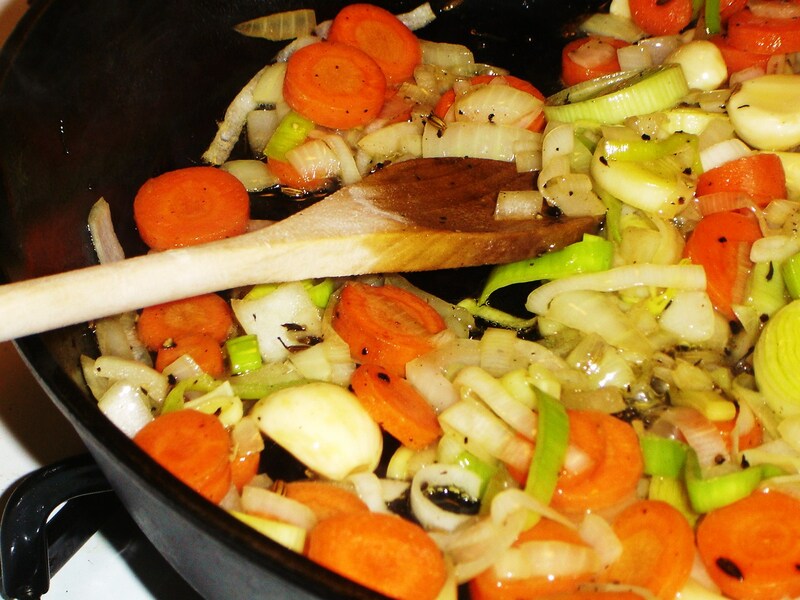 I used diced onions, sliced leeks, and whole garlic cloves as the base. 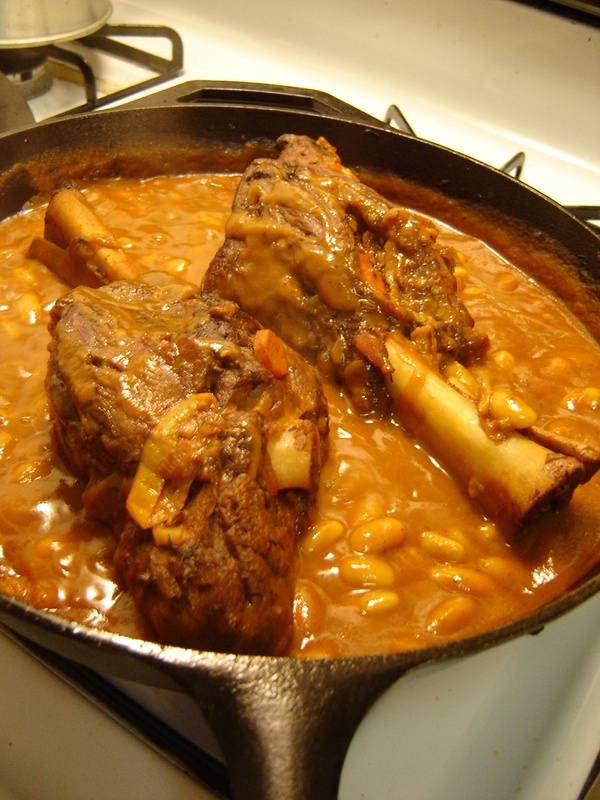 The braising recipes I came across all required a few cups of red wine. But which wine? I usually use cheap wine for cooking (see Charles Shaw Sauvignon Blanc), but I figured that my roommate and I wouldn’t be able to finish off a whole bottle of wine, anyway. Hmm. Not a Beaujolais–Beaujolais is too light and delicate and would get lost in the mix of flavors. What about a Burgundy? Yeah, that makes sense: some good, earthy-spicy Burgundy always goes well with lamb. What about a Chianti? Hmm, that could work as well. I had liked the basic Bourgogne (the 2005 Domaine René Leclerc Bourgogne) Phil had recommended to me last time, but as they were out of that particular wine he recommended instead the Clavelier. This one had by far the lightest color I’ve ever seen in a Burgundy–almost a rosé, it was so pale. The nose was typical Burgundy, but the taste was something else. I got huge notes of cranberry, both in taste and acidity, whereas Alex got green apple. Very light bodied, but with good acidity and good tannins. A bit of spice, though not much. Not much funkiness or earthiness, either. This is a pretty good wine–it’s not substantial and not terribly complex, but it’s pleasant and would definitely be a great thirst-quencher come the summertime. Afterwards, I took out the shanks and added the chopped veggies to the pan, browning them in the combination of lamb juices and olive oil. 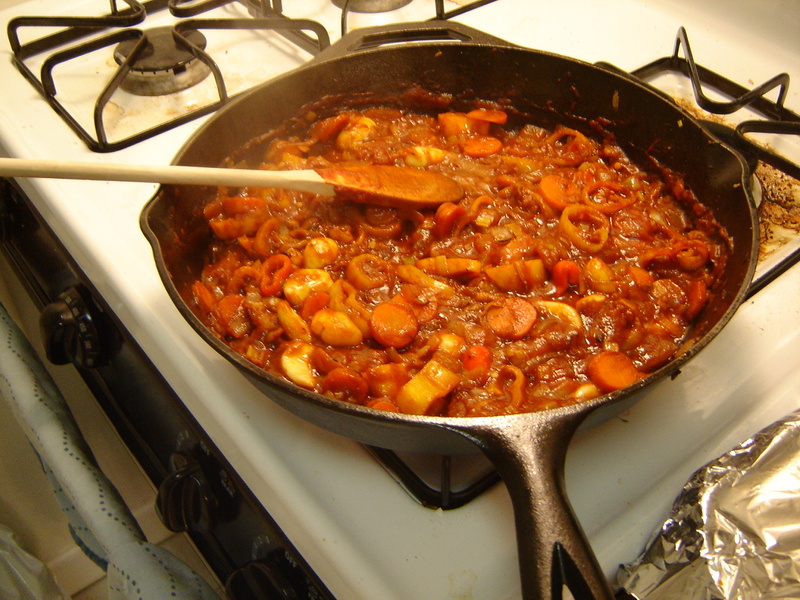 Then, I added a half-can of tomato paste and cooked the mixture for a while. Next, I added some vegetable and chicken stock, sliced sweet peppers, and three cups of the Burgundy. I reduced this before adding the lamb shanks, simmering, then covering the skillet with a lid before putting it into an oven which I had preheated to 350 degrees. 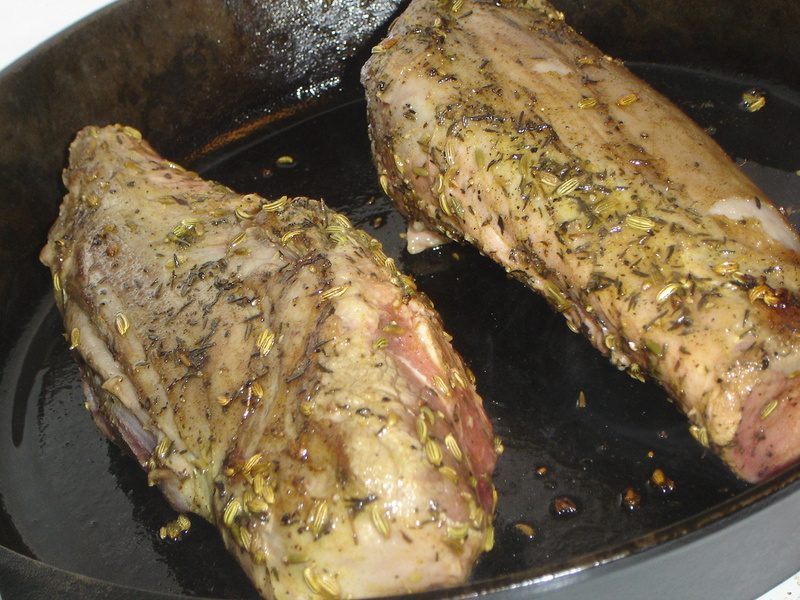 I cooked the lamb for two-and-a-half hours. During this time I turned the shanks every now and then to ensure they cooked evenly, and they looked pretty damn good. After the two-and-a-half hours I cut a little chunk from a shank, and it came right off. Perfect! Removing the shanks, I first took the vegetable sauce and blended it in a blender. I poured the resulting puree through a coarse sieve, leaving only a very nice, smooth sauce behind. Pouring this back into the skillet, I then added two cans of cannellini beans and simmered that some more. So I invited my friend Amy, who lives in the apartment building, to come up and have Alex’s portion and have some Burgundy. I put it all on a plate, grated some lemon zest on top, and served it. How was it? Well, only the bone remained. It was a success, and one I seek to repeat sometime in the near future. It was my faith in your excellent cooking skills that tempted me to consider it. For the public record, the meal smelled and looked delicious. That’s two out of three sensory compliments! Next time I’m going to make braised tofu. You’ll have no excuses then.